My name is James Jeffery. My cancer story starts back in January of this year. Up until that time I’d been very healthy for pretty much my whole life. I exercised a lot, was fit and healthy, rode my bike, played tennis, and went hiking. All that came to a grinding halt in January when I climbed a hill up in the Sooke hills and got extremely cold and came home shaking uncontrollably. At first I thought it was the flu, but about a week later my GP discovered I had a gastrointestinal stromatic tumour, or GIST. It was about then I met Dr. Biberdorf. Dr. Biberdorf made a huge difference. Right from the start he appeared to me to be a very decisive person and someone who had a hands-on approach. Both Sally and I were very confidant to know he was keeping an eye on us. When it came to the operation, I went in thinking there weren’t very good chances of success. Dr. Biberdorf had a Plan A, and I understand that when he opened me up and had a look, turns out he moved to a Plan B, and for that I am eternally grateful. Really, he saved my life. 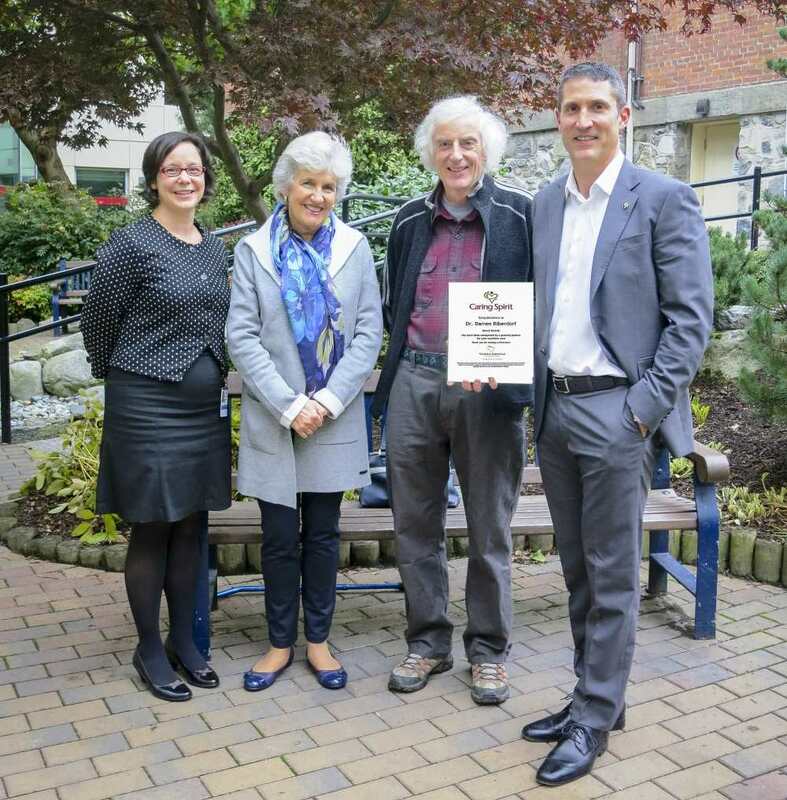 When Dr. Biberdorf brought to my attention the Victoria Hospitals Foundation, it seemed to me their Caring Spirit program was a very appropriate way to recognize Dr. Biberdorf’s skills and the care I received from the whole medical team. So often we help someone in some way, we do them a favour. We don’t expect anything in return, we just do it because that’s a human thing to do, but every once in a while someone thanks us and by thanking us it encourages us. I think it should encourage other surgeons and other medical professionals to come to the Island and to work in this great facility. I’m very grateful for the quality of the care I received through the Jubilee Hospital and particularly Dr. Biberdorf. There’s no doubt there were some pretty ugly outcomes to my diagnosis, and the combination of chemotherapy and radiation and ultimately the surgery really saved my life and for that I’m extremely grateful.